After receiving its last train over 50 years ago, the 1914 brick depot is expecting an exciting move and restoration. Soon the depot is scheduled to be carefully loaded up and moved across the street to its new home next to the Raccoon River Valley Trail. 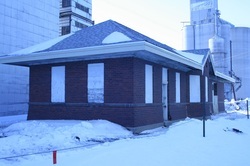 The building will then be restored back to its original condition and become a trailhead/cafe/local museum. The depot will also be placed on the National Register of Historic Places list. Photos are available at: http://minburndepot.shutterfly.com.